Happy Thursday loves! So if you read my post yesterday these are the pictures I was talking about. I was SO excited to get to do some pictures in Key West, especially with my new lens, but word to the wise. When going to an area that is high heat, high humidity and you're keeping the hotel room cold... your camera lens is most likely going to cloud up. And I'm not talking "just wipe it off and you're good to go" cloud up, I'm talking full on cloudy mess INSIDE the lens. We started taking these pictures not even realizing the lens was cloudy (because we always use the viewfinder instead of the screen to shoot) and after a few I asked to see what we were working with. That's when we noticed the pictures looked a bit "foggy". No big deal, I wiped the lens down, we moved and took a few more. Still cloudy. At this point I'm thinking "what is going on here??" so I took then lens off and looked in the back side and bingo, there was our problem. After doing some research this happens a lot to people going to tropical destinations because the room will be less humid and much colder than outside and the lens has natural moisture in it that will cloud up and condense when going straight from inside to outside. Good to know, right? After a minor freak out, investigating how to clear it and just sitting around trying to decide my next steps the lens finally cleared on its own and I was able to continue with the pictures. Unfortunately by that point it was almost time to go to Hemingway House so I only managed to snap a few pictures before it was time to get ready to go. You look lovely. Love the tie and dye dress. love love the cover up! Loving the dress--perfect for your vacation getaway! You may have had issues with your lens, but these pictures are beautiful! You have the perfect laid back keys vibe! Hope you are having a great time! I love that tie-dye coverup and your sandals. Perfect beach getup. I hope you enjoyed Key West. It is one of my most favorite places in Florida and all US. I love that dress!! I have been having the cloudy lens problem big time with our humidity too. So annoying! I need to make a trip down there just to shop at Sophie and Trey! I think the pictures turned out awesome! In love with that cover up! 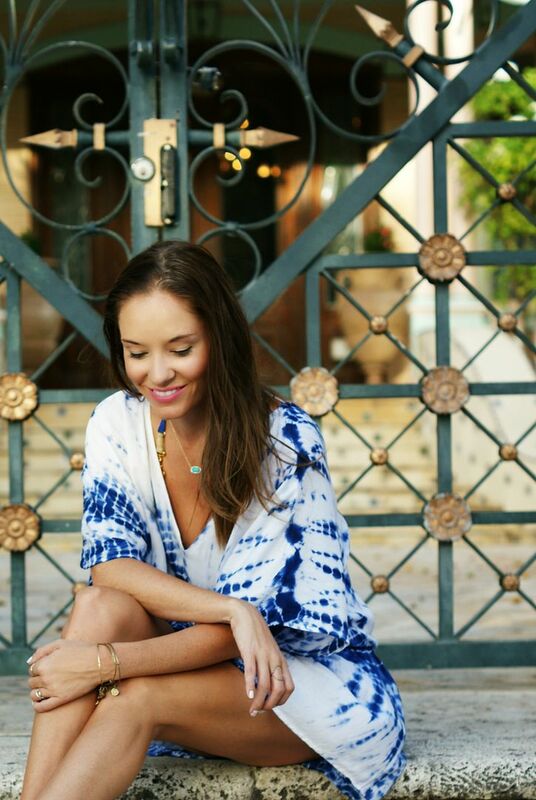 Love the blue and white tie-dye! Perfect with your blue bathing suit! Cloudy lens or not, the pictures are beautiful, and so are you! I love your cover up! I would love to go to Key West someday! The cloudy lens has ruined some vacation pictures for me too - it's the worst! I always feel like it's worse than ever in the morning and then gets better later in the day. The back drop for that first photo is so elegant - I love it! I love the blue and white combo - perfect for summer and especially the fourth! THAT. DRESS. I must have it! I was hoping you were going to do a post on this dress! It's soooo cute!! These pics are beautiful! What a cute dress! I think the pictures look really good! Not cloudy at all! Love the dress too! That coverup is to die for!!! The pictures still turned out stunning! Great post! Great suggestions....I always forget about this in the summer and then get mad when they are hazy!! Love that outfit!!! wow, good to know about the camera! i don't have a fancy camera, but still good to know. the pictures look fabulous though and i love the cover up! I love how the photos came out! Slightly different style to your usual but you still look great and you I love pretty beach coverups! That dress is just gorgeous! I love it!!! Crazy humidity and heat. It always does a number to my glasses and drives me crazy. I can't imagine how infuriating it would be with a lens too lol. The pictures turned out great though! That happened to me this weekend! It was SO humid at the beach and every time I walked outside with my camera, the lens clouded. But on a happy note, these pictures are fab and you look gorgeous! Loving the coverup! I would've freaked out- I'm always worried my camera is broken, even though I baby it. Probably because I have very little idea as to how to fix it if it did! Loving the tie-dye, lady! So pretty and beachy! gorgeous casual summer look! I love the way the photos came out though definitely scary if expensive camera equip breaks! Love the coverup/dress! I love that it totally works as both, and even with a swimsuit underneath it's a little more dressed up than some coverups. I had the same problem in CHS last weekend! I love love love this dress! You would never know you were having lens issues - the photos turned out great! Love that dress! Looooove that cover up! And I had no idea about the lense, I would have freaked out! I'll keep that in mind next time we go tropical! That cover up is amazing, I love tye die!